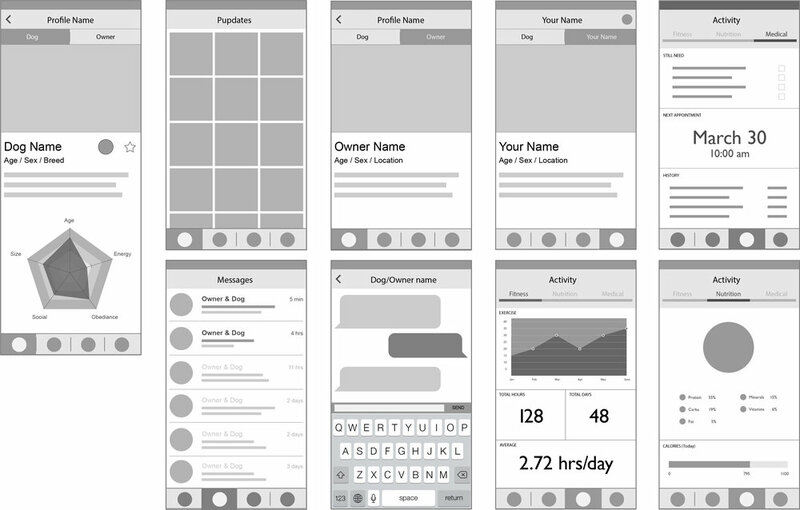 Pupdates is a concept app that I created with two other designers. Designed to encourage and generate puppy playdates, Pupdates strives to inspire owner and dog activity within communities. Through connection and activity, it hopes to result in better care of all dogs and stronger relationships between other owners. How might we connect dog owners to other dog owners and encourage a canine community? We conducted a survey asking dog owners for their opinions and experiences with their furry friends. Our goal was to understand our user's goals and problems. In total we conducted 11 interviews and received 8 responses from the survey we sent out. Across the board, everyone spoken to was interested in meeting new dog owners and creating playtime for their dogs around these meet ups. Some owners are sometimes cautious about introducing their dogs to others because of special needs. With the synthesized data, we developed different personas to represent our user base and how people care for their dogs and interact with the community. We chose to focus on Chelsea as our primary persona because we felt that she would benefit the most from our product. We used her needs and goals to guide our ideation of features. 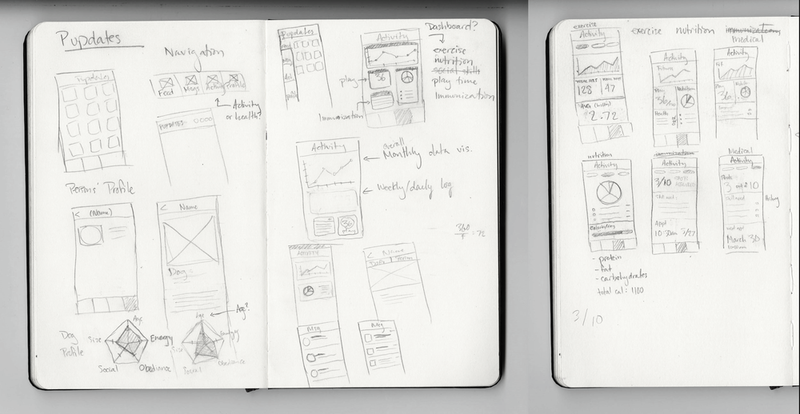 Using our research as our starting point, we began thinking of features that would answer our users' needs. For our product we decided to include a method of displaying an overview of dog's stats (age, height, weight, etc) so that users were able to determine whether they were a suitable match to meet with. Since people were more likely to put more effort into taking care of their dogs if they were held accountable for it, we chose to include a health/fitness tracker to monitor their activities while on their puppy playdates. 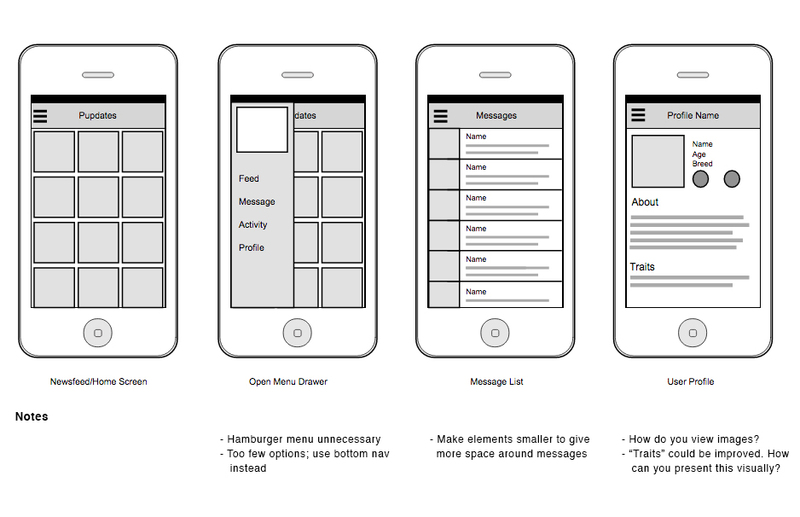 Wireframes were used to communicate design ideas throughout the process. 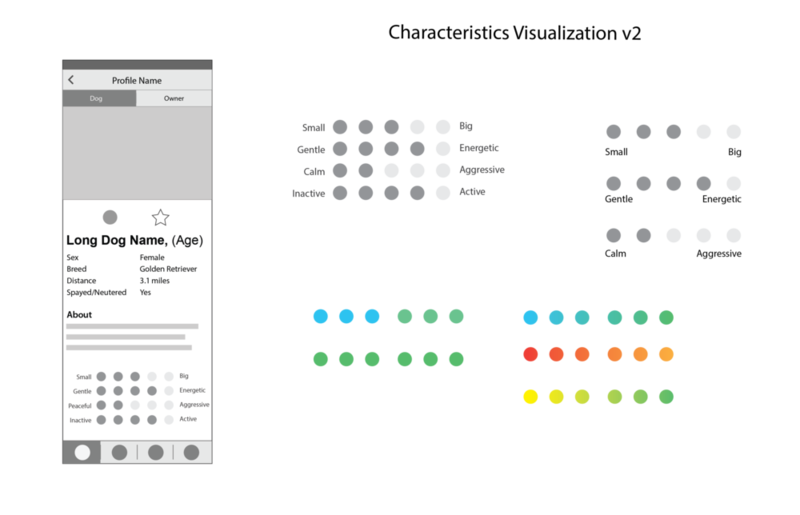 Higher fidelity versions were later used to conduct usability tests with users to validate features. Changed the grid layout into a card style so that users were able to quickly scan through other users as well as see high-level information before deciding to reach out to that profile. For the character visualization, we asked owners what qualities they look for in other dogs before they agree to meet for playdates. We compiled the most common qualities and narrowed them down. We chose the pentagonal chart to display the information, but users were confused with exactly what it was portraying. We realized that a chart like that was better for displaying quantitative data and had to find another solution. After some trial and error we learned that people responded better to a Likert Scale because it gave users limited options with definitive values (ie very small, small, medium, big, very big). We had to be very careful with the wording for the qualities so that they didn't contradict each other and confuse the user even further. The first step of encouraging the community is through connecting dog owners to each other. Entering the app takes you to our home page where you can view other owners within your area. Some users expressed they love taking their dog traveling with them and still wanted to meet other owners. By allowing location-based exploring, they can interact with local dog owners wherever they go. A grid layout was used for easy scanning and high level details about the dog are provided so users can determine whether someone was an appropriate match for their own dog early on. Users felt uneasy about meeting strangers online, especially if all they see are pictures of dogs. 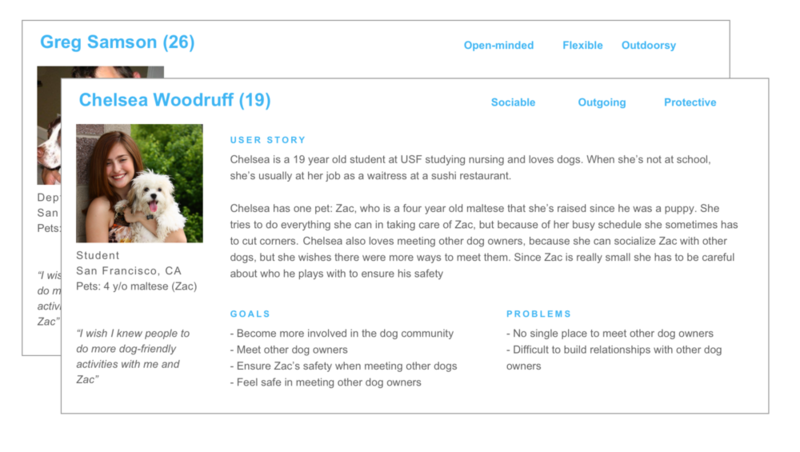 Separate profiles were created to build trust between dog owners while also giving detailed information about the dogs themselves. Sometimes it's not enough to know a dog's breed/age when picking playmates. Some users had dogs with unique needs so they looked for specific traits in other dogs that would complement their play style. The characteristics chart gives a detailed view of these traits for users to determine whether they are a good fit. ie: If your dog was old and small you might not want to let it play with a dog that was large, rough, and energetic. Our research showed that users would be more inclined to do canine activities if there were other people to do them with. A messaging system was necessary for users to directly interact with other dog owners, plan play dates, and keep in touch with owners they've interacted with in the past. Users acknowledged that they would take better care of their dogs if there was something to keep them accountable, like other dog owners, for example. By using Pupdates and participating with dog communities more, we hoped users would take their dogs' health more seriously. The activity tab was created for users to keep detailed records and track their dog's fitness, nutrition, and medical stats to keep them in tip-top shape. In building this project, I learned how invaluable it is to relate your decisions back to your users. It was really easy for us to get so caught up with a "cool" idea without thinking about whether or not it was necessary or benefitted the user. For example, the Activity Stats page feels like an after-thought and doesn't necessarily match our goal of "encouraging canine communities." If I could move forward with Pupdates, I would swap this feature with something more useful, like a canine events page for example.